Preheat oven to moderate 350°F/180°C/gas mark 4. Lightly grease a 9"/24cm or 10"/26cm tart pan, ideally a fluted metal one with a removable bottom. In a small bowl, whisk the egg yolk and sugar together with a teaspoon of the water until pale and fluffy. Set aside. Sift the flour and salt together into a mound on a work surface. Scatter the diced butter over the top of the flour. Quickly toss the butter in the flour so it's all coated, then, using your fingers, rub it in until it resembles breadcrumbs. Keep repeating the operation until it has the consistency of sand. Gather the flour mixture into a mound and make a well in the center. Pour the egg mixture and the rest of the water into the well. Working quickly, incorporate the wet ingredients into the flour, first with your fingertips then with a bench scraper until just mixed but not brought together. Gently gather dough together into a rough ball between your palms. If it stays together, it is sufficiently moist. If it doesn't stay together, add a touch more water and repeat the process. Using the palm of your hand, push away from you to smear the dough across the work surface, gather it up and repeat until it comes together into a smooth, soft ball. You aren't kneading, you are using the smearing action to bind the elements of the dough without developing the gluten in the flour. The dough ball shouldn't spring back when pressed. Lightly flour your work surface and lightly roll the dough out to about 3mm thick in a circle to fit your pan. Press the dough gently into the pan, prick all over the bottom with a fork. Line the tart pan with baking paper and fill with dry beans or pie weights and bake until set, around 9 minutes. Remove pie weights and paper and bake another 6 minutes, until dry. Remove the pastry from the oven and allow to cool in the pan. Leave the oven on. Spread the sugar evenly across the bottom of a small, heavy-based, noncoated saucepan (it needs to be metallic so you can see the color). Heat over a medium-low heat without stirring until the sugar starts to melt and becomes liquid around the edges. Once about a quarter of it has melted, gently stir continuously with a wooden spoon or heat-proof spatula until it turns a deep amber color, a few minutes depending on how high the heat is. Remove from heat and very slowly and carefully pour all (100ml) of the hot cream into the caramel, stirring continuously - it will splutter and steam so be very careful as it is extremely hot. The cream needs to hot and poured very slowly, otherwise the caramel will seize. Keep stirring until it stops bubbling and is well combined then set aside to cool. I couldn't take a lot of pictures of this process because I needed both my hands! In a medium bowl, whisk the eggs together with the milk and powdered sugar. In a small heavy-based saucepan, bring all (200ml) of the cream to a boil. Remove cream from heat and add the broken chocolate. Stir until the chocolate has melted completely and the mixture is smooth. Let cool a few minutes. Pour the chocolate mixture into the egg and milk mixture and stir gently with a spatula to obtain a smooth cream. 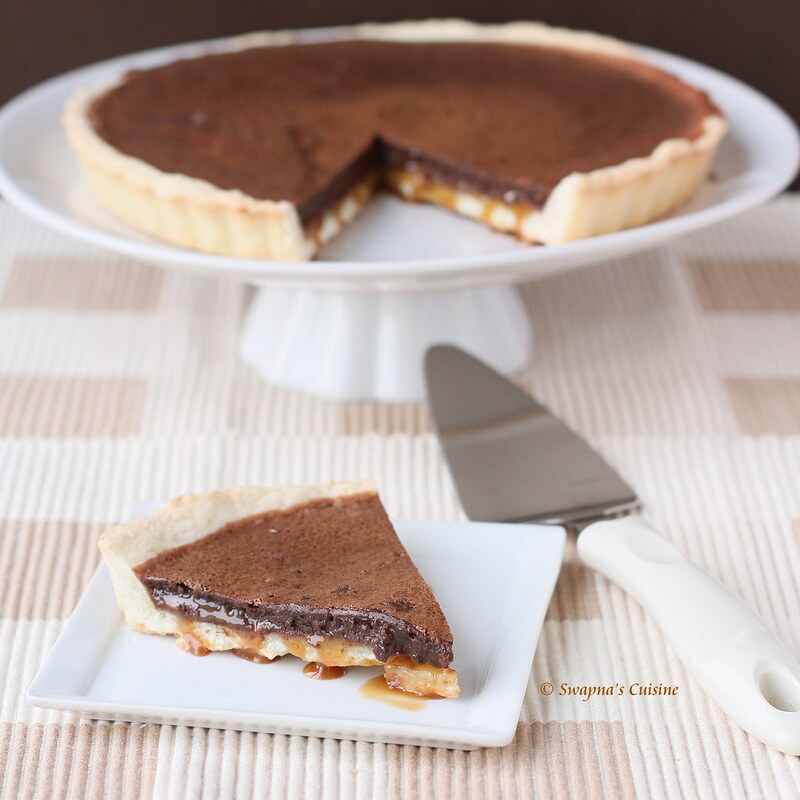 Spread the cooled caramel in the bottom of the cooked tart shell. Gently pour the chocolate cream over the caramel so you don't disturb it. 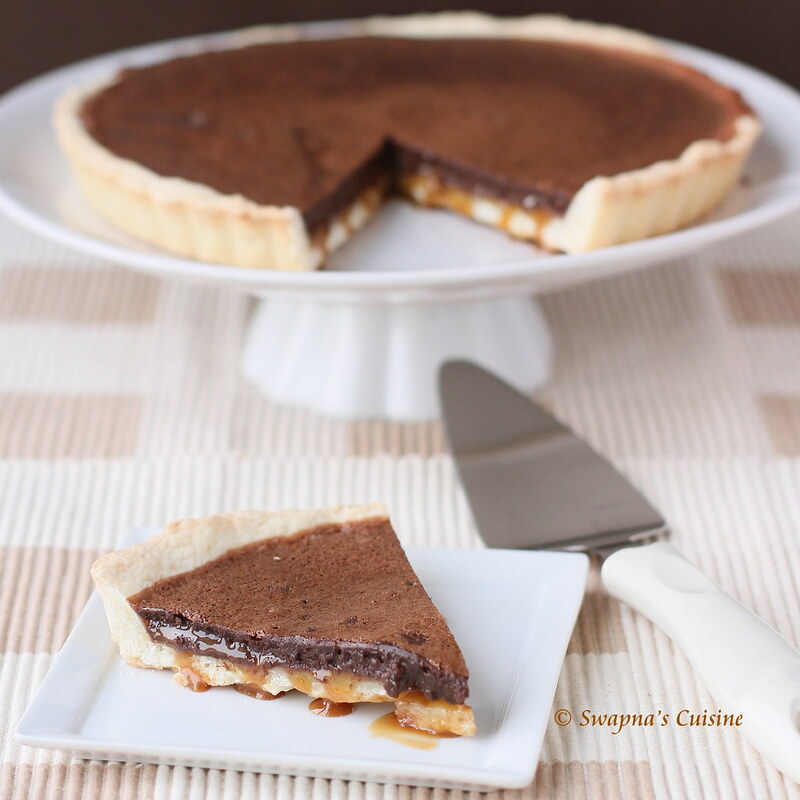 Place the tart into the hot oven and bake for 30 minutes, until the filling has set but is still wobbly in the center. Remove the tart from the oven and allow to cool to room temperature. If using a tart pan with removable bottom, unmold before serving. 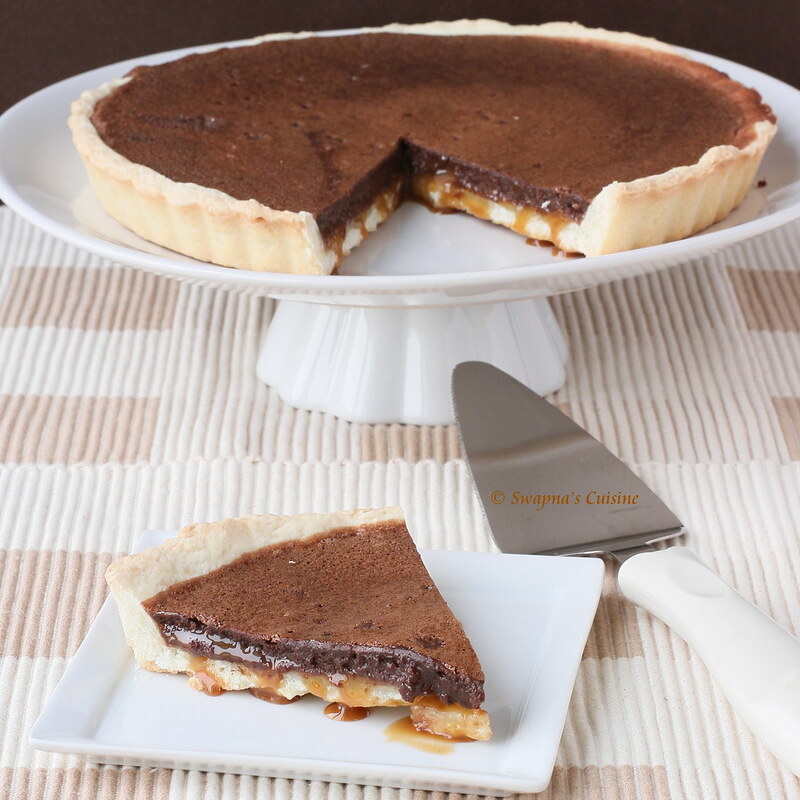 Love to have a huge slice, tart looks fantabulous..
What a delicious tart. Will surely try out soon. Thanks for sharing. Lovely pie with crisp top and gooey center. Cool pictures! It is my favourite one and I'm always looking for original recipes! Now i got it from ur post..